What’s the key to fulfillment in life? According to Ellen Goldsmith-Vein ’84, the leader of a company that represents some of the most creative minds in the entertainment industry, it isn’t just ambition or hard work. Goldsmith-Vein is widely considered to be one of the most powerful women in Hollywood. She was the first talent manager ever featured on the cover of the “Power 100” special issue of The Hollywood Reporter in 2006, and is the only woman to own her own entertainment management company completely. In addition to boasting a client list that includes 500 top directors, writers, producers, authors, illustrators, and publishers, the Gotham Group produces a host of live-action and animated movies and television programs. Goldsmith-Vein spoke of how applying that philosophy as a business woman has helped her not only to achieve personally, but also to inspire her employees. “I have found that a kind word at the right time makes them not only happy in the moment, but more fulfilled, loyal, and in the long run more successful. 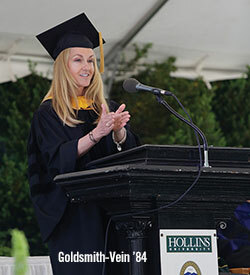 Following Goldsmith-Vein’s address, Thomas Barron, chair of Hollins’ Board of Trustees, awarded her the degree of Doctor of Laws honoris causa in recognition of her personal and career accomplishments. When you visit the Hollins website late this fall, you’ll see something new: an updated design, new photography, and a modern approach to telling the Hollins story in compelling ways. In other words, the design will adapt to the device you’re using, whether it’s a smartphone, tablet, or desktop computer. 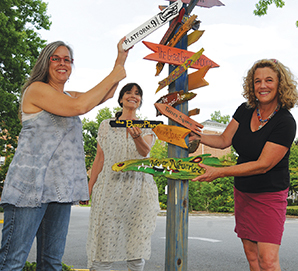 The website redesign is the second phase of Hollins’ research and rebranding efforts. 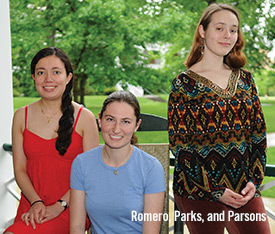 During the 2012-13 academic year, research was conducted through interviews and surveys of every important Hollins audience: alumnae, current and prospective students, parents, and campus community members. Those findings helped inform the rebranding of the university, which found expression in printed materials, including a suite of admission publications and Hollins magazine. The website redesign project began with a review of proposals in the fall of 2013. The expected launch date of the new site is late October or early November. 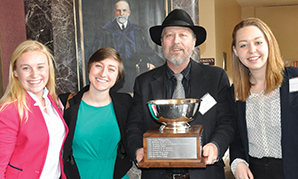 The winning team at the statewide Ethics Bowl last February: Rory Keeley ’17, Morgan Blalock ’16, faculty coordinator Associate Professor of Philosophy James Downey, and Madchen Specht ’16. Specht and Keeley represented Hollins at the Lafayette Debates. Two Hollins students were among “the best and brightest student debaters” at the Lafayette Debates, sponsored by the Embassy of France and George Washington University, in Washington, D.C., in April. Hollins’ invitation to compete came on the heels of the university’s debate team winning the 15th annual statewide collegiate Wells Fargo Ethics Bowl, held in February at Randolph-Macon College. “The executive who organizes the Lafayette Debates witnessed Hollins’ victory and was very impressed,” said Associate Professor of Philosophy James Downey, who serves as the team’s faculty coordinator. Madchen Specht ’16 and Rory Keeley ’17 represented Hollins at the event, which focuses on addressing issues of great importance to both the United States and France as a way to encourage discourse and interaction between the two nations. Hollins faced the United States Military Academy in the first round and then defeated Hampden-Sydney College in the Rivals Round, which pitted rival schools against one another. 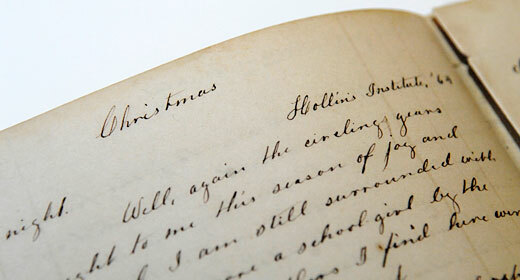 In subsequent rounds, Hollins took on Wake Forest and NYU. 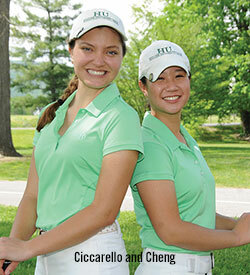 Elizabeth Cheng ’14 and Shannon Ciccarello ’17—one a seasoned collegiate golfer, and the other finishing her first year of competition in April—each had an outstanding golfing year. Cheng, who left her mark as one of Hollins’ most celebrated student-athletes ever, dominated the ODAC conference awards. She received two All-ODAC first-team selections, was named ODAC Women’s Golfer of the Year, and won numerous ODAC Women’s Golfer of the Week awards. She was honored by the Women’s Golf Coaches Association (WGCA) as a three-time All East Region team member, 2013 second-team All American, and 2014 honorable-mention All American. The standout golfer not only excelled on the course, she also performed well in the classroom. ODAC honored the chemistry major as its Women’s Golf Scholar Athlete of the Year for the past two seasons, and the WGCA named her Scholar All American each of her four collegiate seasons. Ciccarello capped a strong first year at Hollins by tying for sixth at the ODAC tournament. Her season average of 85.6 was seventh in the conference tables. She competed in seven events in the spring, posting three top-10 finishes. In addition, Ciccarello was named All-ODAC Second Team.